Mentoring Shooters shows experienced shooters how to help others become safe, responsible gun owners. It also has value for new and prospective shooters as it will inform them both about how to learn and what to look for when seeking out a mentor or instructor. Long-time shooters often possess incredible levels of knowledge and skill. Yet, many consistently fail to help others effectively, sometimes even driving potential shooters away from firearms ownership. This is a trend that must be reversed if our cherished freedoms and culture are to endure for future generations. You can't help someone shoot well without having good shooting skills. But having good shooting skills alone won't make you a good mentor or instructor. To help others, you need skills that go beyond the gun. Mentoring Shooters explains these skills and demonstrates how to apply them in ways that work. "A must add to your library." "Should be required reading for every serious firearms professional." If you're a skilled and experienced shooter, don't let your hard-earned knowledge go to waste. Pass it on. 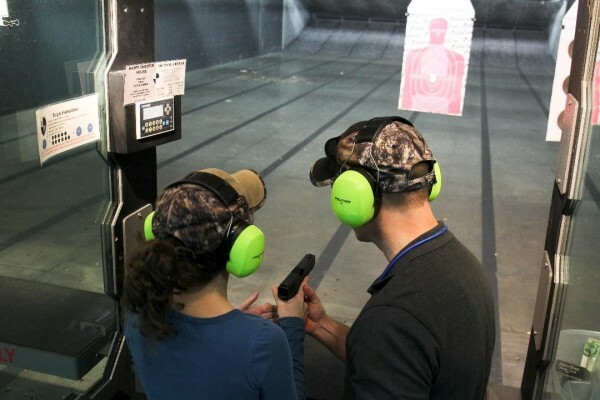 Add to your personal skillset and help advance gun culture by learning these proven skills and methods for helping others learn - the right way - the first time. Mentoring Shooters is a responsibility experienced gun owners all share - and a must read book for anyone who works with new shooters or cares about the future of the shooting community. Developed through extensive scientific literature review and decades of real-world experience in both training and operations, Building Shooters provides a ground-breaking, prescient, and provocative look at the problems (and solutions) facing not only law enforcement trainers, but the whole of the firearms and tactical training industry. Mentoring Shooters is an objective-based book that teaches simple, easily understood techniques that are validated by years of practical application and scientific study. It should be required reading for, and in the library of, every serious firearms professional. Simple, concise, and fresh material on a subject that desperately needed an overhaul. Read this book! This is a must add to your library. Would you like to share your passion of shooting (or anything you enjoy) with someone you know? If so, look no further for a proven system that will help you achieve your mentoring goals. Mentoring Shooters is an outstanding primer that, if followed, will help you get your friends and loved ones up to speed in the shortest amount of time possible. Whether you are new to helping people along or a veteran instructor who has years of experience, Mentoring Shooters is a book chalked full of practical, useful information and training techniques that will help you help others "right now." Combining his years of experience with the latest cutting-edge research on learning, Dustin Salomon has left an indelible mark on the training profession that will withstand the test of time. This book, and his previous work Building Shooters, are must reads for anyone who is serious about training, and this is precisely why Dustin's works are on our recommended reading list for all instructors/mentors. Owner, Distributed Security, Inc .
Mentoring Shooters is a must-read for anyone who mentors or instructs firearms users, especially new instructors. I plan to have all instructors at Tactical Advantage read it. The emphasis placed on teaching future generations a culture of safety and personal responsibility regarding gun ownership and use is exactly right; firearms safety is the top priority. I know personally that real-world deadly force encounters rely on fundamentally sound firearms safety enhanced with good, solid and ongoing training. 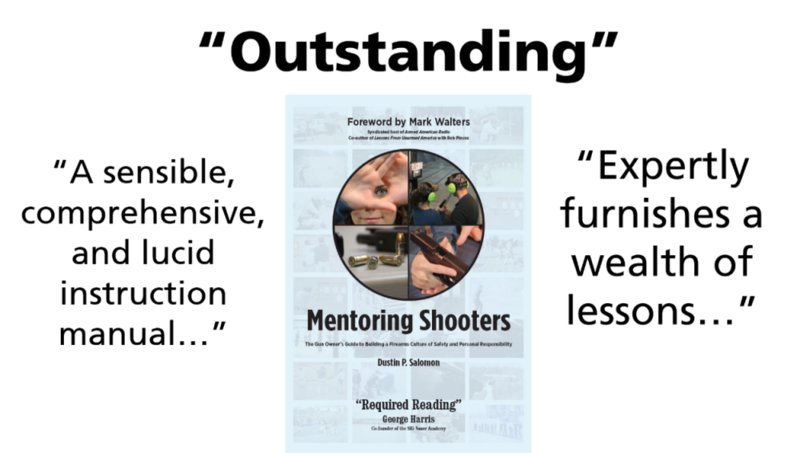 Anyone who works with inexperienced shooters...whether as a friend, relative, or as a professional instructor needs to read Mentoring Shooters. A shooter's early instruction with a firearm can chart their direction for life. Make it a fun, comfortable, safe experience and it's likely that they'll grow to love shooting as much as you do. Overwhelm them, scare them, or frustrate them and it's like pouring salt in a garden. Mentoring Shooters is a serious upgrade over traditional firearms training methods and it will show you the most effective ways to help new or inexperienced shooters comfortably and safely handle pistols and have early success shooting. Most importantly, you'll learn how to do it so they'll actually remember what you taught them days, weeks, and months later. You'll learn the right (and wrong) words to use, how to stack the deck in your favor for early fun and success, how to diagnose and address common challenges that most new shooters have, and more.